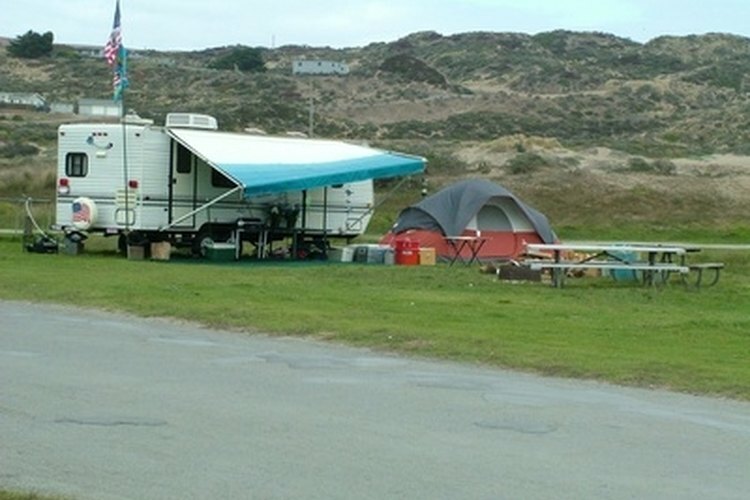 Damaged RV awnings should be removed from the RV. Removing an RV awning is necessary at times when the unit requires replacement or repair. The removal process is not something that can be accomplished alone. It takes two to three individuals to remove the awning unit. Choose a day without wind or rain to perform this task. Remove any travel covers from the awning. Release the travel locks on the awning arms. There is one located on each side of the awning. Locate the cam locks on either side of the awning tube and set the cam to the roll-down position. Usually this is accomplished by moving the cam lever down towards the ground. There should be an indicator on the cam that shows the roll-down position. Roll out the awning 12 inches. If the cam locks are damaged or inoperable, use a short board to hold the awning in this position. Locate the hole in the end cap for the cotter pin. There is a hole on each side of the awning tube in the cam assembly. The inner tube must be manually turned until the holes line up. Insert the cotter pin through the hole and bend the ends outward with pliers to secure. Repeat this procedure on the opposite side. Locate the lag bolts that attach the awning unit to the rafters of the RV. Remove these lag bolts and set aside for later. Set up two sawhorses so that they are close enough for the awning tube to rest on without it touching the ground. Position them so that they easily accessible without causing a tripping hazard. Have a helper hold each awning arm. Locate the screws that secure the awning fabric to the awning arms. Look for the screws near the cam area. Remove this screw from each side of the awning. Set aside for later. Hold the awning tube while the helpers hold each awning arm. Walk the entire awning assembly off of the RV. The person holding the awning tube will be walking backward, so proceed with caution. Set the awning tube down across the sawhorses for easy access to the cam assembly and to prevent damage to the tube. Take care not to bend the awning arms, they are made from aluminum and are easily damaged. Have enough help so that the weight of the awning is supported once the lag bolts are removed. Leaving the awning unsupported can result in the unit falling off of the RV, causing damage to both units. "Trailer Life's RV Repair & Maintenance Manual", 4th Edition, by Bob Livingston, 2002.